Benefit uses old-school sports to raise money for kids — and throw a party in the process. As a high-school athlete who grew up getting picked before most of the boys in gym class, Salene Castaneda knows firsthand how empowering — and how fun — sports can be. She tried to impart that to the kids she served as the founder of a West Oakland rec center, mixing regular games of dodgeball in with homework help and the like. When two of the kids she worked with managed to beat the odds and get into college but couldn't afford laptops, Castaneda decided to help them out by throwing a benefit, and it was only natural that the event center around sports. Dodgeball was a no-brainer: it's fun, simple, and has a kind of happy-go-lucky, noncompetitive sensibility that was appealing to Castaneda. She gathered twelve friends, split them up into two teams, and Girl-on-Girl Dodgeball was born. They didn't raise enough money for laptops, but Castaneda did take the kids on a shopping spree for dorm-life staples like sheets and towels. And moreover, everyone had enough fun that Castaneda decided to do it again the following year. That was in 2000, and in the ten years since, the event has grown exponentially — though Castaneda and her fellow organizers stayed underground until last year when they formed an LLC, bought insurance, and took the whole thing to Richmond's newly-renovated Craneway Pavilion (1414 Harbour Way South, Richmond). What began as an underground fundraiser for needy kids has grown to include 1,200 women on 32 teams vying for a $1,000 cash prize in one of the East Bay's bigger venues. It's also become a subculture unto itself, according to Castaneda's wife, Candy Eros Diaz, who said she more or less married dodgeball when she and Castaneda wed in 2006. Buses are being chartered from LA, and though the event doesn't explicitly align itself with any orientation in particular, Diaz and Castaneda said it's come to be a cultural institution for queer women in the Bay Area. 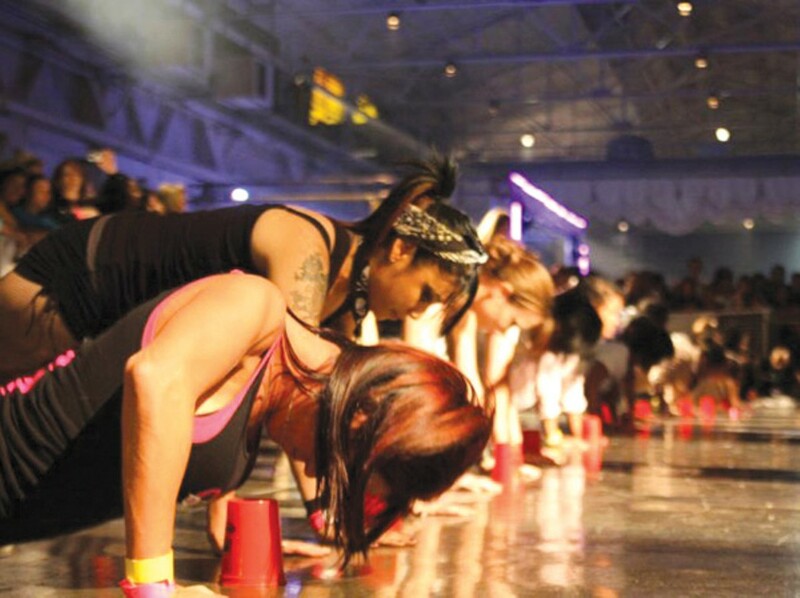 The event itself has expanded to include push-up and arm-wrestling contests, as well as several DJs, food, and a full bar. "It's kind of like a sporting event combined with a nightclub," Diaz said. It has the same culture and nostalgia-cool cache as roller derby, with which it shares both fans and organizers (derby girls will serve as Saturday's referees), but it's got the added bonus of benefiting a good cause: proceeds go to various groups supporting womens' and girls' athletics. "It's about supporting girls with ambition," Castaneda said. But for all their high-minded intentions, Diaz admitted dodgeball is also about something more primal: "We want to remember when we didn't have any worries in life and just [beaned] each other with balls." Girl-on-Girl Dodgeball happens Sat. Nov. 13. Brackets are sold out but anyone is invited to watch the tournament. 6:30 p.m., free. GirlOnGirlDodgeball.com.